So Fox News is asserting that Democratic leaders and the GOP-appointed special counsel are aligned in a “deep state” conspiracy to undermine the President. With partisan-charged rhetoric like “thwart,” “tempest,” “flood,” and “plotted,” Fox News makes its biases clear. 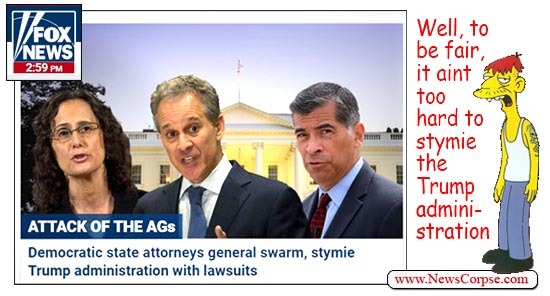 And they seem to be surprised that “blue-state attorneys general” have political differences with the extremist agenda of Trump and his blindly obedient Republican comrades. The article also characterizes the work of the Democratic AGs as purely partisan, rather than inspired by their Democratic principles. Fundraising and campaigning takes up a fair amount of space in the column. But most of all the author focuses on the “sheer volume” of multistate lawsuits (35 so far) that have been filed against the Trump administration. Near the end of the article it finally acknowledges that “Republican attorneys general brought 46 multistate legal challenges” during the Obama administration. Although that was for the full eight years. If there are any reasons to justify an increase in lawsuits currently, it’s because Trump and his cohorts are so determined to violate the law. In so many areas of his government, this president continues to prove his disdain for the law. It infects almost every cabinet department. And the GOP-run Congress refuses to conduct any oversight. That’s why it has been necessary for Democrats to respond by going to court. The issues span ObamaCare, DACA, Muslim bans, the environment, the Consumer Financial Protection Bureau, student loans, network neutrality, fracking and offshore drilling, transgender troops, civil and voting rights, and many more. If anything, it’s surprising that there haven’t been even more lawsuits. There surely will be as time goes by. Trump continues to break laws related to his businesses. He is still profiting from his presidency. And many of his cabinet secretaries are doing the same. That is, the ones that haven’t already been forced out in scandal and disgrace. And yet, the only thing that Fox thinks is newsworthy about this is that honest public servants are working hard to do something about Trump’s lawlessness. Meanwhile, Fox couldn’t care less about the lawlessness itself. Last Friday Devin Nunes, the Republican chairman of the House Select Committee on Intelligence, unveiled his super-hyped FISA memo. He promised it would expose the FBI as a conspirator in the “deep state” cabal to destroy Donald Trump’s presidency. The fallacy that he floated rested on the premise that the FBI misled the FISA court by omitting material facts. Kilmeade: There was some acknowledgement that this was a political document – meaning the dossier – in a footnote at the bottom of the FISA warrant. What can you tell us about that? 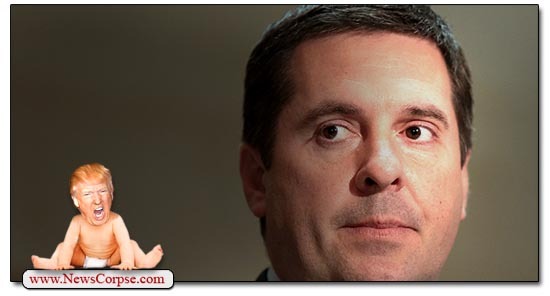 Nunes: A footnote saying something may be political is a far cry from letting the American people know that the Democrats and the Hillary campaign paid for dirt that the FBI then used to get a warrant on an American citizen to spy on another campaign. First of all, a footnote disclosing precisely what Nunes said was never disclosed proves that Nunes was deliberately lying in his memo. Footnotes are not trivialities meant to be dismissed. They are notations with additional information of interest. The fact that Nunes tried to hide their existence reveals his dishonest intent. Secondly, a footnote in a classified application to the FISA Court was never meant to be a communication to the American people. So the FBI wasn’t hiding that data, they were complying with the law. Finally, the warrant wasn’t used to spy on another campaign. It was used to monitor Carter Page who was no longer with the Trump campaign at the time the warrant was issued. Later in the same Fox and Friends interview, Nunes accused committee Democrats of being the source of “more than a hundred leaks,” but he refused to provide any evidence for the accusation. He also asserted that Democrats have come up with “goose eggs” on whether Trump colluded with Russia. This is a common theme among Republicans. But they seem to be oblivious to the fact that whatever evidence exists is in the hands of special counsel Robert Mueller, and he isn’t talking. All of this is further proof of the bad faith smears orchestrated by Nunes and his GOP henchmen. As usual, the more facts that emerge about any pseudo-scandal trumped up by Republicans, the more they are exposed as shameless liars. And in this case it was Nunes himself who drew back the curtain on his own dishonesty. Ironic, isn’t it?